PHOTO: Braxton Mathews with the 18 1/32" smallmouth bass that earned him 1st place in the Junior Division of the 2015 Bass Derby. Congratulations to Braxton, the other prize winners and those who managed to catch a fish! The 2015 edition of the Grand River Bass Derby featured a lot of good catches and the usual stories to go with them - and the bigger ones that got away! Thanks to all those who help by sponsoring and/or providing prizes for this event. Participants really appreciate the awards ceremony at the end! 1st: Alan Crowe, $2,000 cash for his 20 1/8" catch. 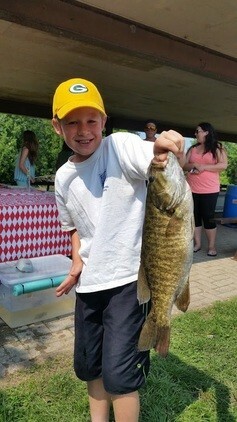 1st: Braxton Mathews, fishing package for his 18 1/32" smallmouth bass. Hope to see you out at next year's derby!